White House Press Secretary Jay Carney on Wednesday declined to rule out that enhanced interrogation techniques helped lead the government to Osama bin Laden. A reporter asked Carney: "It sounds to me at the very least like what you're saying is that the interrogation techniques cannot be ruled out as a critical and necessary piece to have found bin Laden. Is that correct?" "Now, I can't categorically rule out that one piece of information -- because we don't know," Carney responded before lauding the work of the intelligence community. Earlier, Carney said that "no single piece of information, with the exception of the address of the compound, was vital to this, was singularly vital to this, because we're talking about tiny bits of information that were compiled by unbelievably competent professionals over nine and a half years." "The fact is, is that information was gathered from detainees," he continued. "We have multiple ways of gathering information: from detainees, from different methods that we have of getting information. The work that was done that put the case together was done primarily by analysts gathering tiny bits of information and putting it together and creating a body of work, if you will, that led to the finding of the location where Osama bin Laden was hiding." On Capitol Hill, meanwhile, a partisan fault line emerged over whether information gleaned from harsh interrogations contributed to the capture and killing of bin Laden. Democrats, who generally oppose waterboarding and other controversial tactics, insist that such tactics played absolutely no role in tracking down bin Laden. Republicans contend that one of the most important leads -- the identity of bin Laden's courier -- was gleaned in part from harsh interrogation of terrorist detainees in secret prisons. "To the best of our knowledge based on a look, none of (the leads) came as a result of harsh interrogation practices," California Democratic Senator Diane Feinstein argued yesterday. Feinstein chairs the powerful Senate Intelligence Committee and was first briefed about the possible break in the bin Laden search in December of 2010. New York Republican Rep. Peter King, chair of the Homeland Security Committee, said the opposite was true in an interview with CBS New York. "Osama Bin Laden would not have been captured and killed if it were not for the initial information we got from Khalid Sheikh Mohammed after he was waterboarded," he insisted. Not so, countered the top Democrat on the House Intelligence Committee, Rep. Dutch Ruppersberger (D-MD). "It's clear if you waterboard people you'll just hear what you want to hear," Ruppersberger said. Members of Congress are also divided over whether the capture of bin Laden vindicates Bush Administration officials who advocated the use of waterboarding and other tactics. House Majority Leader Eric Cantor argued that "we believe information gained, if valuable in saving American lives in increasing the security of the United States, is a policy we should have in place." Feinstein disagreed. "I happen to know a good deal about how those interrogations were conducted and in my view nothing justifies the kind of procedures that were used." Jose Rodriguez, the former head of the CIA's counterterrorism center who oversaw the use of "enhanced interrogation techniques," told Time this week that "information provided by KSM and Abu Faraj al-Libi about Bin Laden's courier was the lead information that eventually led to the location of [bin Laden's] compound and the operation that led to his death." 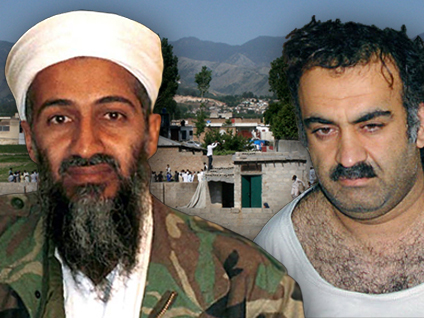 Reports revealed that two key terror detainees -- Khalid Sheikh Mohammed and Abu Faraj al-Libi -- gave American officials the nickname of a courier who ultimately led U.S. intelligence officials to bin Laden. The two detainees gave the initial information up at foreign CIA "black sites," where waterboarding -- historically considered a form of torture by the U.S. -- and other "enhanced interrogation" techniques were used. It's not clear that the information was gleaned through those techniques.